To receive updates via PM or email when updated, mark as a "Favorite" in the box to the right. The Auctioneer Suite provides you with the tools and data necessary to make those difficult auctioning decisions with ease. From purchasing to posting, the Auctioneer Suite provides time-tested tools to allow you more time to actually play your characters or play the market. As you will soon discover, it is much more than a simple "Auctioning AddOn", the Auctioneer Suite also shows in-depth information for all game items, such as those used in quests or recipes, enchanting, milling, prospecting and more. 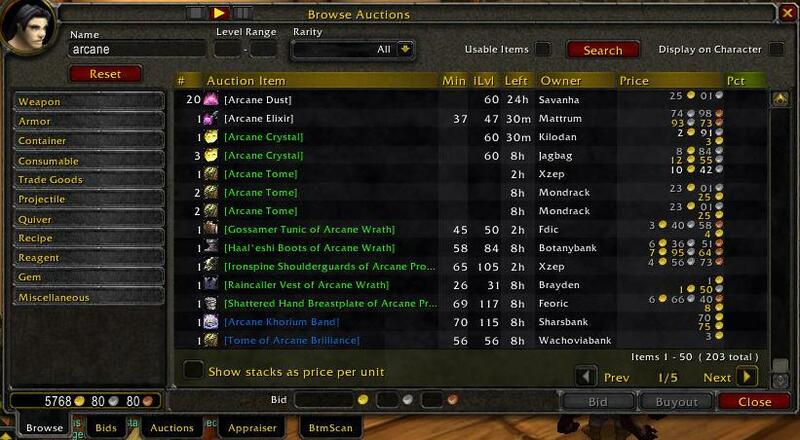 Numerous other AddOns will also use the Auctioneer statistics you gather via scanning. This is especially true for many of the popular crafting AddOns, such as Little Sparky's Workshop. Looking for Lightweight and Fast? Try the "Auctioneer" download from our primary site, rather than the "Auctioneer Suite" we upload to Curse and WoWInterface. All of our downloads are accessible from our primary site at http://auctioneeraddon.com/dl . This version offers a small footprint, with only the basic "Post" frame and tooltip information to assist in your purchasing decisions. Be sure to remove all old files- follow the instructions at http://wiki.norganna.org/Installing . Please, do not post errors here; instead, kindly visit http://forums.norganna.org/ , our Support Forum, and be sure to search before posting- many questions and errors reported are duplicates. For the fastest service, various questions are addressed in the Auctioneer FAQ, http://wiki.norganna.orgAuctioneer/FAQ . We have gone to great lengths to ensure that the most common issues have been addressed. Questions, comments, concerns, alphas/betas (when available), bug reports, the occasional bit of praise? An intuitive auction posting frame. Remembers your preferences for bid/buyout prices, stack sizes, and number of listings to post per item. Displays competing listings, the age of the data, and allows you to sort these listings and refresh them easily. Provides a scrollable list of all auctionable items in your bags; allowing you to quickly post all of your goods. Provides the ability to change to a "Simple" view; a bit like the Auctioneer Classic posting interface. Allows you to change column width by Right-Clicking and dragging to the column width of your choice. Allows you to post multiple auctions with the single click of the Batch Post button. Alt+Left-Click == Refresh Pricing of all Batch Postable Items. Shift+Left-Click==Trial Posting, prints the pricing to your chat window, but does not post any items, allowing you to verify settings. Ctrl+Shift+Alt+Left-Click==Post all items that have the "Allow Batch Posting" checkbox selected (located at the top of the item information pane). An alternative to the standard auction browsing interface. There are a variety of fully customizable statistic modules included with Auctioneer that can provide a variety of pricing information- all based upon your needs. "Market Price" - a custom designed formula that merges the various statistics into a usable price. This is the default setting and is highly recommended. Auc-Stat-Histogram - Returns Median and IQR values, based upon a Histogram of pricing data. Essentially, a median value, based upon all prices ever seen; no data is ever discarded. Auc-Stat-iLevel - Statistics modules that groups all items of same rarity, type, and iLevel together (e.g. all green weapons of iLevel 180). Useful for pricing random "of the ..." items. Auc-Stat-Sales – Uses data from BeanCounter to display historical statistics on actual purchase and sale prices. Note that this statistic is installed along with BeanCounter, and cannot be installed separately. Auc-Stat-Simple - Statistics module that performs simple averaging of data, converted daily to exponential moving averages of the orders 3, 7 and 14. Auc-Stat-StdDev - Statistics module that keeps the last 100 price points for an item and performs a standard deviation on the data list to exclude outliers from the sample space and provide a normalized mean. Auc-Stat-WOWEcon - Statistics module that uses the WOWEcon AddOn's data (if separately installed) to provide the price to other Auctioneer modules. Any other stat module that you or others wish to create can be easily added to auctioneer functionality! An Auctioneer Utility that prompts you when it sees auctions that fit your criteria for buying and, or, bidding. The "RealTimeSearch" will continually reload the first and last page of the AH, within reason, as per your configuration, to find the newest bargains and auctions that are just about to come to an end. Both great times to find some amazing deals. An associated AddOn that tracks your bid, postings, and mail to help you determine your overall and item-specific profitability. Creates journal entries when you bid, buy, post, or retrieve AH mail. Enchantrix displays values for disenchanting, milling, and prospecting; plus suggested values for selling enchants. Enchantrix can also automate disenchanting, milling and prospecting. Some baseline pricing is built in, but Enchantrix also uses values from Auctioneer to provide up-to-date prices for your server/faction. Enchantrix also includes controls to let you customize the pricing by enchant material (fixed prices and weighting). Informant displays additional information about items in their tooltips: buy price; sell price; item level; what quests, classes or professions use the item; the value of the item produced by a recipe; etc. Informant can also tell you what vendors sell a given item. What can Auctioneer do to help me? 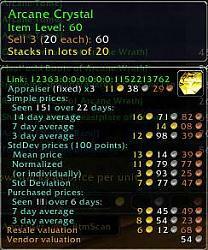 Once a user moves to the Auction House (AH) and beyond just buying and selling from/to vendors, the whole game changes. No longer is the user dealing with the static prices of the vendor to support their character's income. We are now dealing with the fluid and hectic nature of a dog-eat-dog market economy. In such an economy, which is in a constant state of flux, it can be difficult to select the correct pricing points for your item at the AH. Sometimes, the prices and value of your items can be wildly different compared to the vendor price due to many factors, the value of items that can be made from your item, the use of a particular item in a quest, the suitability of a particular weapon or armor to specific classes, and the disenchantability of an item to enchanters. Primarily, the driving factor of the price fluctuations, as in the real world is supply versus demand. When supply is high, but demand is low, competition drives the prices down, and conversely then supply is low, but demand is high, the market is driven into a sellers market. The Auctioneer Suite can help you alleviate this lack of market knowledge over time by watching the market evolve. When you go to the Auction House (AH) for the first time after installing Auctioneer, you will see a row of 3 buttons along the top of the main "Browse" frame, click the "play" button to begin your first scan of the entire AH. Auctioneer will begin recording statistics for every item it finds, including the bid, buyout, and more. Once the market analysis has completed, you will notice additional information about the items in the tooltips when you mouse over them. What happens when you go to sell items via the Auction House? If Auctioneer has enough data, when you try to put an auction up for sale, it will attempt to provide you with intelligent pricing points based upon the market data it has accumulated through scanning. When you select an item in the full or simple "Appraiser" frame, Auctioneer will suggest a minimum price, a buyout price and display relevant data about it's decision making process in the right, receipt window, including how it has arrived at its prices. When you place an item in the SimpleAuction, "Post" frame, Auctioneer will suggest a minimum bid, a buyout price, and display relevant data, including the deposit and more. What are the available pricing models, or statistics, again? There are numerous pricing models from which to choose, they are discussed in the FAQ, located at http://Wiki.Norganna.Org/Auctioneer/FAQ. We hope this helps people to understand the Auctioneer Suite a bit better. Visit our main site for indepth information and help - http://AuctioneerAddOn.Com or visit http://FishEye.Norganna.Org to view the current changelog. Nikk and the rest of the Team at Norganna's AddOns. The latest release for the Auctioneer Suite (AuctioneerSuite-8.1.6242.zip) has been built for World of Warcraft 8.1 (Battle for Azeroth / Tides of Vengeance). For the latest nightly builds, head over to the Downloads page (https://www.auctioneeraddon.com/) to get it now. If you have any issues with it, please join our slack channel (linked at the same page) and let us know. Timeouts and Internal Auction Errors with only some items. And I also tried v8.0.6174 of Auctioneer, but got the same timeouts and errors, with just these two items (at least out of what I was posting). Last edited by Wizardling : 01-08-19 at 03:08 PM. You can always just delete the other addons out of your addon folder. Yeah, every time this updates, but it's not like you *have* to use the other things. Or just turn them off in your in-game addon list. I see an update was just released. But posting is still broken, stuck in a loop every time. Auctioneer is broken as of an hour ago. link = "|cff1eff00|Hitem:24776::::::::94:262::29:1:1681:::|h[Boneshredder Gloves of the Quickblade]|h|r"
checkname = "Boneshredder Gloves of the Quickblade"
name = "Boneshredder Gloves of the Quickblade"
Over on Curseforge.com, the norganna folks commented on Feb 8 and on March 20th that they were having problems with their hosting, and are taking the opportunity to make some 'back end' changes. I poked them about posting here, hopefully we'll get an update too! Please be advised that we are down for maintenance and will be back up as soon as possible. Why does this addon come with hidden addons as well...? Enchantrix? ?if i want that I would look for it...Sldebar??? ?a very unwelcome eye sore on my screen...and this informant...OMFG is it ever a memory HOG!!!!! !All wanted was the auctioneer addon and it came with unwelcome and irritating surprises that run in the background and are major memory sponges. I mean that informant is sooo bad It causes my system to lag in a manor I have never seen before...The Auctioneer addon is awesome...but the others that piggyback into your game with it..NOT SO MUCH!!!!! The Auctioneer suite comes with several packages that are meant to work specifically with Auctioneer. I love Enchantrix, and Informant especially. These support packages are not hidden, there is a bare bones Auctioneer down load as well, and you can easily turn any or all of them off. Last edited by timreh : 04-04-18 at 06:58 AM. On AddOns subject ... I believe Blizzard should create a Free Developer Program to allow AddON Developers to access resources, privileged info, tools, etc. in a timely fashion. Good Addons make the game better, a better game make players happy, happy players make Blizzard grow. I can only find auctioneer on this site or curse. It appears that the old norganna related websites are down or gone. Using the old whois etc searches return unknown type results. Which has been showing this for a long time now. Last edited by Danuke : 03-27-18 at 05:37 AM. Last edited by jeffy162 : 04-09-17 at 11:45 AM. Last edited by osiris093 : 03-28-17 at 11:30 PM. I don't know how else to contact you, but your forums apparently got an issue with local mailer. Help us to continue providing some of the most popular AddOns for World of Warcraft! Donations go toward our costs; maintaining our development environment to allow our international team to collaborate effectively and efficiently. Questions? Contact us via http://Forums.Norganna.Org .